The annual police operation to track down drink-drivers was launched at the Foxhunter, Enderby, yesterday (Tuesday 29th November. 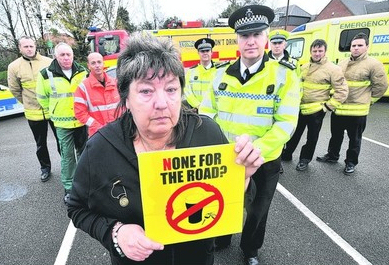 The “None for the Road” campaign will see extra officers on the roads until the beginning of the new year.? It was launched with the help of Dawn Johnson-Bycraft, whose motorcyclist son, David, was killed by an over-the-limit driver seven years ago. “Some people seem to think drinking and driving is mainly a problem among young people, but it’s not. “The people who do this are men and women of all ages and from all backgrounds – and it has to stop. David, 33, of Earl Shilton, was killed when a drink-driver lost control of his car and crashed into his motorcycle in Station Road, Elmesthorpe, in September 2004. His fiancée, who was riding pillion, was seriously hurt but survived the crash. A roadside test at the time showed the driver was one-and-a-half times over the legal limit. He was jailed for three-and-a-half years and banned from the road for five years. “We arrest people for drink-driving throughout the year, but during the festive period they are more likely to go to parties or works dos, where alcohol is readily available. “People have to make plans for getting home safely before they go out, whether it is by taxi, other public transport or having a designated driver among their group. During last year’s four-week operation, police caught 125 drink-drivers.